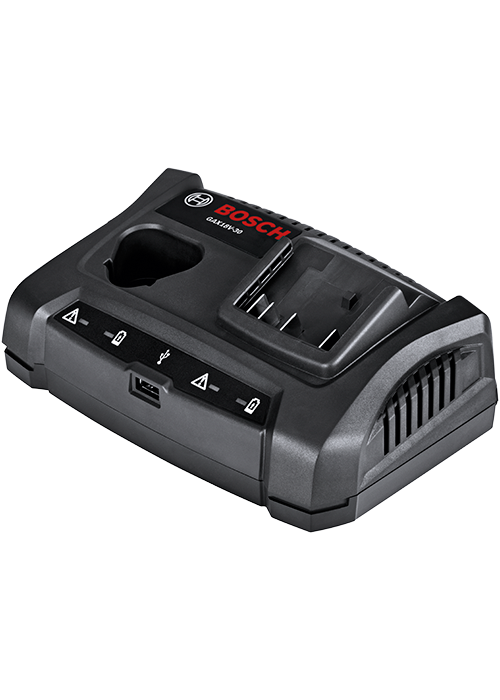 The Bosch GAX18 V-30 18 V/12V Dual-Bay Charger can charge Bosch 18 V, Bosch 12 V Max and mobile phone batteries. This one charger provides the ultimate convenience to users who need to charge both Bosch 12 V Max batteries and Bosch 18 V batteries. It also provides a 2.4 Amp max USB port to power up a cell phone (and other devices). It quickly charges batteries and it provides LED indicators so users can monitor the charging while they work. It charges a spent Bosch 18 V 4.0 Ah battery in 85 minutes and a spent Bosch 12 V Max 2.0 Ah battery in 45 minutes.